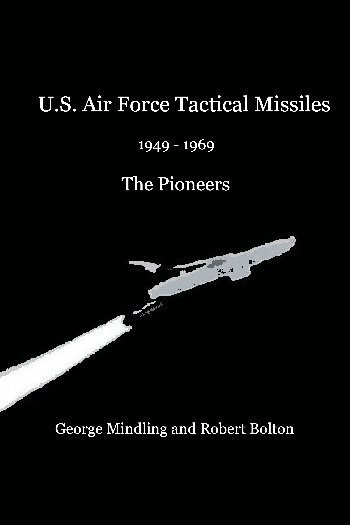 The history of the airframe and guidance systems that composed the tactical missiles Matador and Mace, are a time line of continuing American development of the earlier World War II German V-1 Buzz Bomb, beginning with the JB-2 Loon. The first powered flight by a man-made aircraft took place on May 6, 1896, with the launch of Samuel Langley´s Aerodrome Number Five by catapult from a houseboat on the Potomac River near Quantico, Virginia. The flight covered over a half mile, and was followed by Aerodrome Number Six on November 28, 1896 which flew for nearly a mile. The first powered flight was by unmanned aircraft. While the successful flights were only by 3/4 scale models of aircraft that were on the drawing board, the flights were deemed successful, while the flights of the actual aircraft that were tested later, were not. During the First World War, a project to develop an unmanned aircraft that could be used as a sacrificial weapon to intentionally crash into a target was undertaken by both the U.S. Navy and the U.S. Army Signal Corps Air Divison. The Navy version, called an "aerial torpedo", was developed by Elmer Sperry in 1915. The successful project lasted until 1922 when funding for the development of the unmanned aircraft was exhausted. The later U.S. Army project, called the Kettering Liberty Eagle, or commonly as the "Bug" boasted mixed success but was also terminated in the early twenties. During the 1930s, several projects to equip aircraft with radio controls were attempted, again with mixed success. Biplanes gave way to monoplanes, and several designs were even multi-engined propeller driven aircraft. Several designs specifically dedicated to the unmanned concept also flew, but the field of unmanned aircraft, or guided missiles was never fully exploited by American designers. One U.S. project of 1942 - 1943 was designed by Jack Northrop and utilized his famous flying wing concept. It was known as the JB-1 "Bat" and was powered by two of the new GE jet engines that were developed from the English Whittle jet engine. The JB-1 "Bat" was considered underpowered and testing of the guided missile did not lead to serious developement. The military attitude toward unmanned aircraft and guided missiles changed drastically on June 12, 1944, when Germany launched a massive air attack against Great Britain with a guided missile powered by a pulse jet engine. 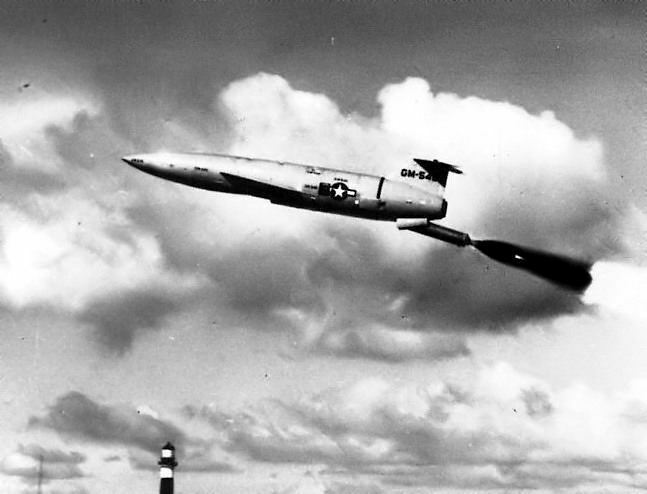 The new weapon was the V-1 cruise missile. 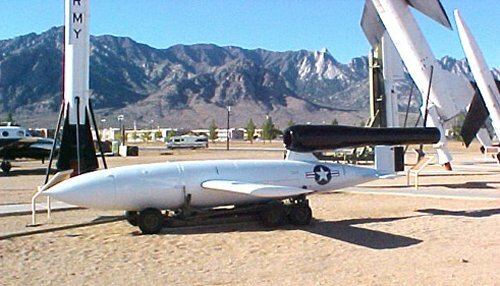 A JB-2 Loon at the White Sands Missile Range Museum. This American made copy of the infamous German V-1 Buzz Bomb was America's first cruise missile. In July 1944, three weeks after German V-1 "Buzz Bombs" first struck England on June 12th and 13th, American engineers fired a working copy of the German V-1 pulse-jet engine, "reverse-engineered" from crashed German V-1 buzzbombs that were flown back to Wright Field, Ohio for analysis. The reverse engineering, called at the time a "Chinese Copy" provided the design of America's first mass-produced guided missile, the JB-2. The first unmanned guided missile in America's arsenal. The first launch of a JB-2 took place at Eglin Army Air Field in Florida in October 1944. 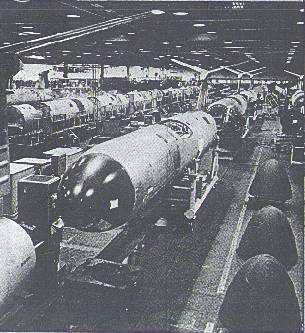 In addition to the Eglin group, a detachment of the Special Weapons Branch, Wright Field, Ohio, arrived at Wendover Field in Utah in 1944 with the mission of evaluating captured & experimental rocket systems, including the JB-2. Testing was at a site just south of Wendover's Technical Site. Contracts were let for production of 2,000 weapons, designated JB-2, for "Jet Bomb"-2. Powered by One Ford IJ-15-1 770 lbs thrust pulsejet engine which was reversed engineered from the captured German Argus-Schmidt pulsejet in the V-1, the airframe was to be built by Republic Aviation, but sub-contracted the airframe to Willys-Overland. Production of the JB-2 came to an end after the close of the 2nd World War, in September 1945,with 1,385 JB-2s delivered to the USAAF. Test launches continued, both at Wendover and Eglin. On January 26, 1946, Army Air Forces created the First Experimental Guided Missiles Group to develop and test missiles at Eglin Field. In the immediate post-war years, this organization launched and evaluated the JB-2 and performed extensive work with drone aircraft. The U.S. Army Air Force continued development of the JB-2 as Project MX-544, with two versions: one with preset internal guidance and another with radar control. Several launch platforms were developed, including permanent and portable ramps, and mobile launching from beneath the wings of B-17G or B-29 bombers. After World War II, the JB-2 played a significant role in the development of surface-to-surface missile systems. 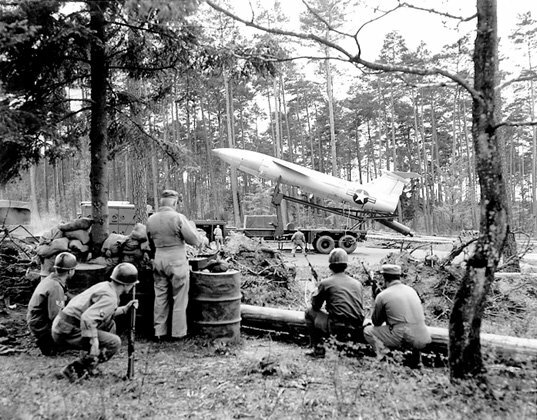 Testing continued from 1944 to 1946 at Eglin Army Air Field, Florida, to improve launch and guidance. The U.S. Navy developed a submarine-launched version, KUW-1 Loon, later called LTV-N-2, which were carried on the aft deck in watertight containers. The SS 337 Carbonero, pictured, was the 2nd US Submarine to launch the Loon. The first was the SS 348 Cusk which successfully launched its first Loon on February 12th, 1947, off Point Mugu, California. After the United States Air Force became a fully independent arm of the National Military Establishment (later renamed to the Department of Defense) on September 18, 1947, research continued with the development of unmanned aircraft and pilotless bombers, including the already available JB-2 and the sub-sonic, 500 mile range XSSM-A-1 which had been specified in December of 1945. The contract for developing the XSSM-A-1 was awarded to the Glenn L. Martin Company of Baltimore, Maryland and was known as the MX-771 project. The XSSM-A-1 would become the B-61 Matador, the U.S. Air Forces first operational missile. 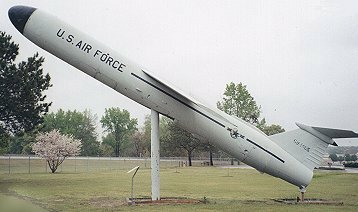 The USAF Air Materiel Command reactivated the JB-2 as Project EO-727-12 on 23 April 1948, at Holloman AFB, New Mexico, the former Alamogordo Army Air Field. The JB-2 was used for development of missile guidance control and seeker systems, testing of telemetering and optical tracking facilities, and as a target for new surface-to-air and air-to-air missiles. The JB-2 project used the North American Aviation NATIV (North American Test Instrument Vehicle) Blockhouse and two launch ramps at Holloman: a 400-ft, two-rail ramp on a 3 degree earth-filled slope, and a 40-ft trailer ramp. The earth-filled ramp was scheduled for completion in January 1948. The first firing of a JB-2 at Holloman Air Force Base occurred on 3 May 1948, and the last took place 10 January 1949, after 11 missions. The last JB-2 launch occurred just 10 days before the first launch of the new Martin XB-61 Matador. The JB-2 program was concluded after successful development of a radio guidance system which could launch, turn, circle, and skid-land a JB-2 under the control of an airborne or ground transmitter. There are over twenty five of the remaining JB-2/LTV-N-2 airframes that have been restored by aviation museums around the country, including the US Air Force Museum in Wright Patterson Air Force Base, Ohio. The US Register of Historic Places lists two sites on US Air Force property at Eglin Air Force Base. 8OK246 and 8OK248, both on Santa Rosa Island, that include the wreckage and remnants of 18 JB-2 missiles that crashed in the sand and are still part of the Florida landscape. The airframe of at least one other unlaunched JB-2 is believed to be also buried somewhere in the dunes. "The JB-2 launch ramp was completed ca. 1947 in the MTSA (see Figure 12 and Appendix C). The structure does not have a facility number and no real property records were located. The structure consists of a long, earthen ramp (Figure 74). Without a Real Property Accountable Record, there is no record of functions for the ramp after the JB-2 test program ended in 1948. 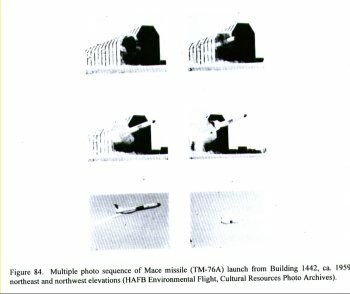 Archival research by Mattson and Tagg (1995) and Weitze (1997) indicate the ramp was modified for other missile testing in 1949 and 1950. As described earlier, Hughes Aircraft Company is apparently responsible for the modifications of the loading pit and the addition of the concrete and wooden features at the north end of the ramp, as well as for many of the concrete pads on either side of the ramp. Currently the JB-2 Ramp is abandoned." 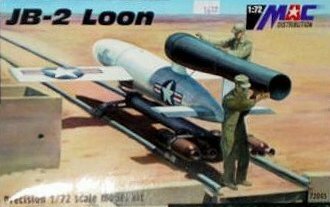 The Author purchased this AMC 1\72nd scale plastic model of a JB-2 Loon on e-bay. The box cover is a representation of the photo above.
" Figure 74. 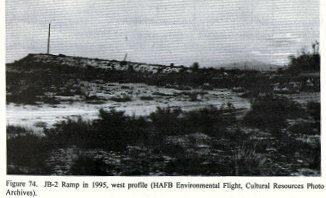 JB-2 Ramp in 1995, west profile (HAFB Environmental Flight, Cultural Resources Photo Archives). Original 1947 drawings show a 440' long earthen ramp with a concrete loading pit (Figure 75). The ramp ranges in width from 10' at the south end to 80' at the north end and faces 330 degrees. The ramp bed is inclined at a 3 degree slope, starting at the existing ground level (south end) and rising to a height at the north end of approximately 24'. Two parallel, 75 pound ASCE (American Society of Civil Engineers) rails are set 4'11" apart and run for 392'2" along the top. The track sits on 18" tall steel I-beams resting on 77 standard 8" x 1' x 7' wood cross-ties. A bed of 10" thick reinforced concrete was poured over a compacted subgrade between I-beams. 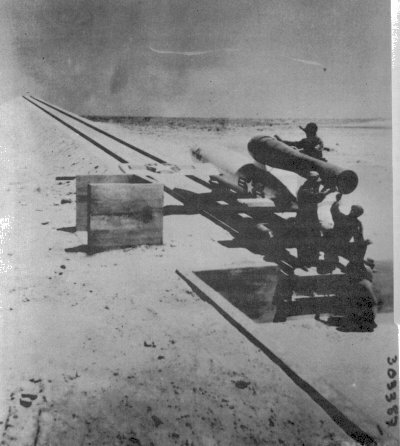 The rails were apparently transferred from JB-2 test facilities at Wendover AAF in Utah and used in the construction of this ramp. At the north end of the ramp a concrete stairway leads down to a 20' x 40' concrete pad cut into the ramp. The pad is elevated about 4 feet above the present ground surface with two sets of concrete steps running to the ground. A partially obscured, semisubterranean cable trench runs from beneath this feature southeast to Building 1116. A 5' x 10' concrete pad sits at the north end of the ramp beyond the rails, and 2" x 10" wood planks extend from this feature to a metal tower situated just off the end of the ramp. A wood flume runs from a channel between the end of the rails and this pad to three concrete pads situated below the ramp. A wooden stairway also runs off the west side of the ramp (Mattson and Tagg 1995:38-43)." " The loading pit, situated at the south end of the ramp, is rectangular with a flared apron at the south end. The pit is 20 feet x 16 feet x 3 feet 3" deep with 8" thick concrete walls and the apron is 20 feet long and 34 feet wide at its widest point. The pit was apparently once open to the south but has been enclosed with a concrete wall; a 6'4" x 5'4" entryway is now situated in the center of this wall. The height of the pit walls has also been extended 4 feet, encasing the southern ends of the rails. A “reinforced concrete structure” is shown just west of the south end of the track by the loading pit (CE File IE 232). A 1948 photograph verifies this feature as being U-shaped (see Figure 64). An identical structure is now located on the east side of the track. It has 8" thick concrete walls and floor and inside dimensions of 6´ x 4´ x 4´ deep (Mattson and Tagg 1995:39-43). 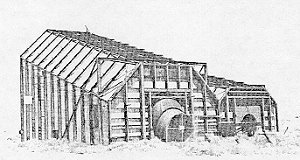 The original architectural drawings, labeled as-built, were provided by the War Department, U.S. Army Corps of Engineers, Office of the District Engineer (Albuquerque, New Mexico). The builder is unknown." " The JB-2 Ramp retains its original size and shape and maintains historic integrity. Most of the original materials used to construct the earthen ramp are still visible, although some modifications have occurred. Only 105 ft of rail at the south end and a single rail in the center of the ramp remain intact. The remainder has been cut off and removed. The loading pit and north end of the track have been modified with concrete and wood features, and these features are deteriorating and responsible for erosion of the earthen ramp. The addition of these features has not obscured original workmanship, however. They contribute to the ramp’s early Cold War period of significance." Figure 75. 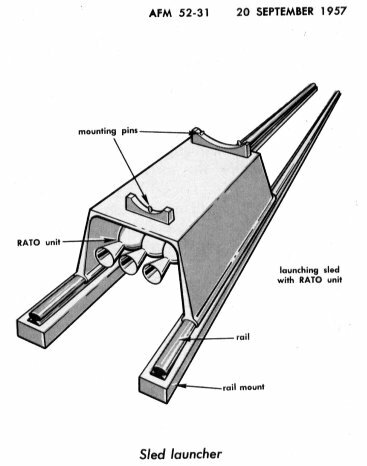 JB-2 Ramp; profile, plan view, and cross section, ca. 1947, and plan view with later modifications as it appeared in 1996. a launching area on a 1957 base map and locally known as the MTSA (see Figure 12). Contemporary facilities and features such as Building 1116, which was used as the observation shelter for the JB-2 and Falcon missile programs, and numerous concrete pads and features still remain in the vicinity. The structure was used for its original purpose until missile testing was no longer conducted at the MTSA in the late 1950s. Since that time it has been abandoned. The structure continues to exhibit its historic character as a test vehicle launch ramp and retains its integrity of association with early Cold War missile testing"
"I am an eBay seller and picked up the scrapbook of a soldier in the 321st Squadron Armament group who was part of the group who tested the JB-2 at Ladd Field in 1946-47. Please see attached USAF photo of JB-2 test plane (sic)." "Shortly after takeoff or during take off the JB-2 exploded and the soldier had photos of the wreckage." 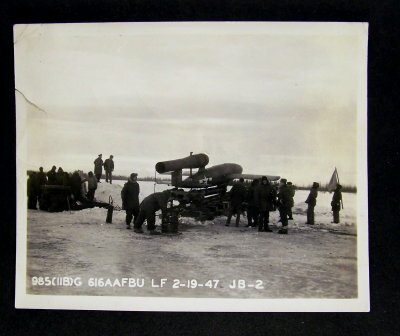 "The soldier also had several photos of the firing of this JB-2 engine at -58 and -62 degree farenheit and the soldier apparently worked on version 7 of the JB-2 Engine personally." "Ladd field was used for the land lease plane program with Russia during WWII and also was a cold weather testing facility of not only the JB-2 but also several other planes and a helicopter outfitted with tank treads. A very interesting scrapbook which was falling apart and I am selling piecemeal." "You may wish to expand this website to include the Ladd Field experiments." 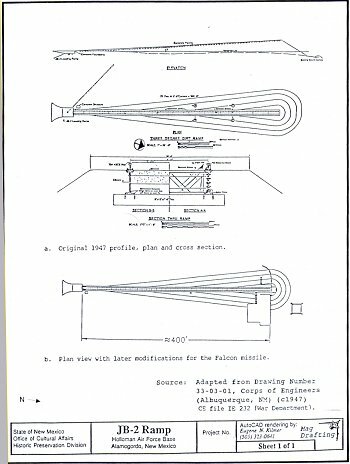 The U.S. Army Air Force Air Material Command issued a design standard for a missile that could fly between 175 and 500 miles at speeds of 600 mph, or even supersonic speeds in 1945. The project was called MX-771 and had two parts: A subsonic version numbered the XSSM-A-1 and a supersonic model numbered the XSSM-A-2. The Glenn L. Martin Co. signed the contract with the US Army Air Force on April 22, 1946 to design and build the missiles stipulated by Project MX-771. The supersonic part of the project was cancelled within the year as it was duplicated by the MX-770 North American Aviation project that became the SM-64 (X-10) Navaho. 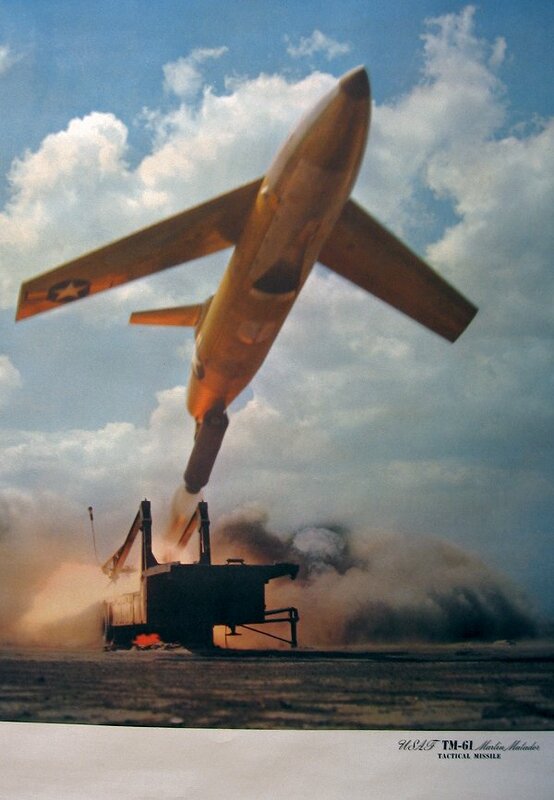 Testing the new Martin subsonic missile, named the Matador, began at Holloman AFB in 1948. 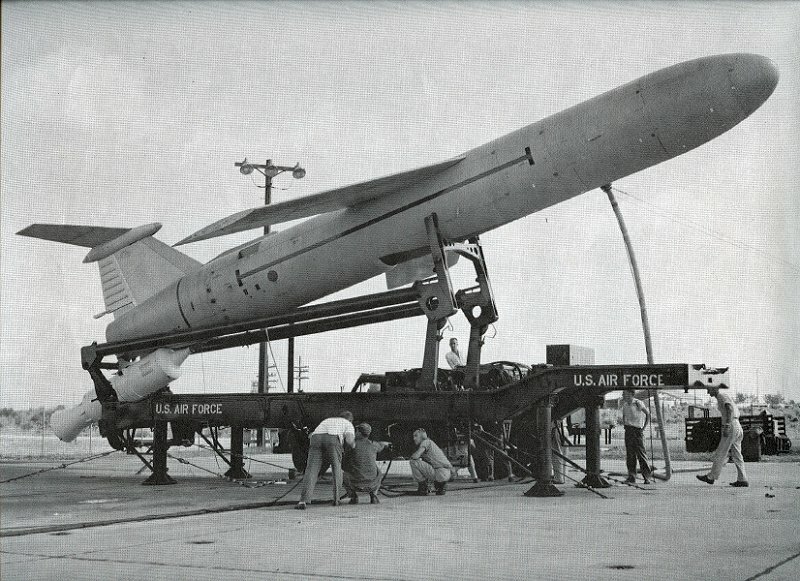 The first Matador, model XSSM-A-1, was successfully launched at the White Sands Missile Range on 20 January 1949, not far from the launch ramp used by the JB-2 program which concluded only 10 days earlier. 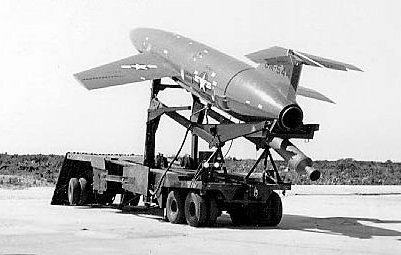 Matador flight testing was moved to Cape Canaveral, Florida, in 1950, and the YB-61 Matador had the distinction of being the first missile launched at the Cape to utilize the Atlantic Missile Tracking Range. Redesignated to its production identifier, the B-61, the experimental version was labeled XB-61, the prototype became the YB-61. All prefixes to the B designator were dropped once the missile had been accepted by the US Air Force. The TM, or Tactical Missile designator was not applied until 1955. At that time, the original B-61 was redesignated as the TM-61A as two newer Matador models were in development: the TM-61B, which became the TM-76A Mace, and the TM-61C, the last operational Matador phased out in 1962. A YB-61 Prototype, one of the original 18 "Red" Matadors, sits on its Zero Length Launcher, at Patrick Air Force Base, Florida. This USAF/Glenn L. Martin Photo was used as the cover of the "Martin Star," the Glenn L. Martin Company magazine on its November, 1951 issue. A XB-61 heads downrange from Cape Canaveral (Notice the old lighthouse) in this undated USAF photo. Notice the flat mid-fuselage mounting of the wings and the conventional horizontal stabilizer with traditional control elevators, and the closable door panels over the booster rocket mounting point. The tail number appears to be GM 546 (GM was used before before the standard year-of-contract tail numbering system was initiated), the 3rd Matador of 280 launched from the Cape and Patrick AFB by both the Martin Co.and Air Force test and operational units. In this photo of XB-61 GM-544, the first Matador launched from Cape Canaveral on 20 June 1951, the elevators on the horizontal stabilizer are readily apparent. The left finger spoilers (There is a set mounted in each wing) are seen in the far extreme reaches of the wingspan. Later versions moved the spoilers in to about mid-wing position and made more parallel to the leading edge of the wing. In this Martin photo of a B-61A being prepared for launch, notice the wings have been moved to the top of the fuselage with 10 degrees negative dihedral (anhedral or cathedral) and the horizontal stabilizer has been modified to the "flying wing" style stabilizer, called a Variable Incidence Horizontal Stabilizer, and given 15 degrees dihedral. The new head on profile was instantly recognizable and became the trademark of both the Matador and Mace missiles. The closeable doors for the RATO booster bottle were also dropped. The length has been stretched and the diameter of the fuselage has been made more consistant with the 54 inch requirement of the J-33 A-31 (later A-37 and A-41) jet engine. 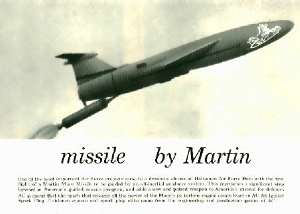 The upper mid-fuselage breather doors were a trade mark of all the Martin series winged missiles. A TM-76 Mace "B" was filmed headed downrange from Pad 21 at the Cape with the red plastic dust covers that were normally used only while the missile was in storage or in transit, firmly in place, trailing the red "Remove before flight" streamers behind. An operational B-61A Matador on alert at Hahn Air Base sometime in the Fifties in this undated and uncredited USAF Museum Photo. The unit was probably the 69th Pilotless Bomber Squadron, stationed at Hahn in that time frame. By 1957, the major guided missile and experimental test programs of the late 1940s and early 1950s had completed their ground launch testing, with the exception of the Aerobee. 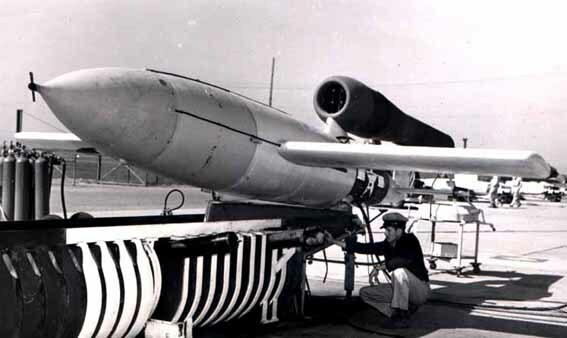 The focus at HAFB during the late 1950s was on air-launched guided missiles, target drones, and components testing planned for the High Speed Test Track (HSTT). The only ground-launched vehicles tested during this time were the drone versions of the Matador and development testing of the new Mace. Flight testing included two launches in late 1957 and early 1958 of the TM-76A Mace (renumbered several months earlier from its original designation of TM-61B Matador) that were targeted to Wendover Gunnery range in Utah, almost 700 miles away! 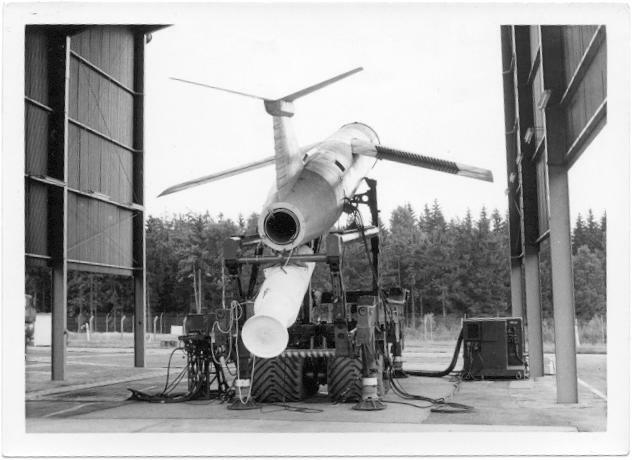 Original flight tests were with the ATRAN guided TM-76A, including development of the Rapid Fire Multiple Launch concept, and support of Detachment 1, 4504th Missile Training Wing out of Orlando AFB that was involved in training crews for deployment to Germany. The first 6 launches of the hardsite, inertially guided, longe range TM-76B were launched from a sheltered zero length “hardsite” called the ZEL (ZEro Length) site, Able 51, before being moved to Cape Canaveral in 1959 for final testing and crew training. Two intact buildings, 1440 and 1442, and numerous concrete pads remain at this launch facility at Holloman. Figure 78. Mace missile (TM-76A) launch from Able 51/ZEL site (Building 1442), 12 May 1959 (HAFB Environmental Flight, Cultural Resources Photo Archives). 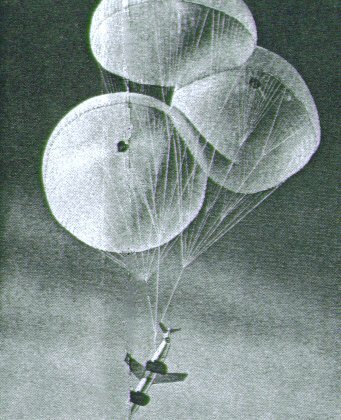 A TM-76A is launched from the sheltered Zero Length launcher. Notice the bulge under the aft fuselage to house the airbags for missile recovery. White sands also had special dogs, called "the Missile Dogs" to find errant birds that failed to follow their planned flight path. 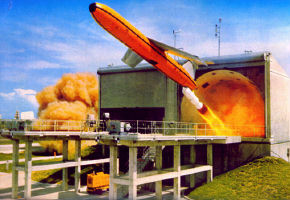 The ZEL facility (The building 1442 covered site: all Matadors and Maces were launched from Zero Length Launchers, regardless of launch location) was used primarily for testing the Mace "B" missile, although the Matador missile and the BQM-34A Firebee drone were also launched from mobile launchers tied down to concrete pads at the site (Figure 79). 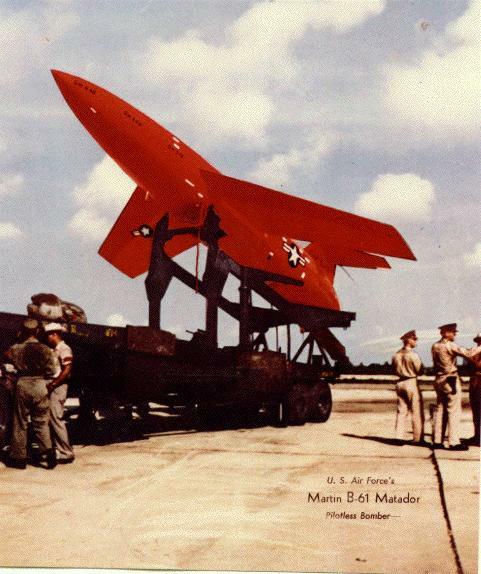 The Matador was the first USAF missile to reach operational status. It was a high altitude, high supersonic, (Webmaster´s note: only in terminal dive after the wings had been separated by primercord) surface-to-surface missile which had been tested at HAFB since 1949 and became operational in 1954 with the deployment of the 1st Pilotless Bomber Squadron to Bitburg Air Base, Germany. The Matador had various project designations including MX-771, XB (experimental bomber)-61, TM-61, and Martin B-61. The two operational versions of the Matador (TM-61A and the TM-61C) were 39´9" long, weighed 12,000 to 13,000 pounds, and had a wing span of 28´10" . They were powered by an Allison J-33-A37 jet engine that produced 4,600 pounds of thrust. A single Thiokol booter, giving 50,000 pounds of thrust, was used to launch the missile. Matadors were launched from mobile launchers tethered to concrete pads just north of Building 1440, the launch control blockhouse. The transporter could not be used as a launcher, so the missile was transferred to a ZEL launcher that resembled the flatbed trailer of a tractor trailer. The launcher was elevated to give a 15 degree positive angle of attack for launch. There is photographic evidence that the Matador was launched from the MTSA. Mace "A" recovery photo by Glenn L. Martin, Co. The Hardsite Shelter (Building 1442) includes two launch bays, the larger for F-100 fighter aircraft and the smaller for Mace missile launch (Figure 29). The structural exoskeleton is composed of 13 I-beam frame segments of progressively increasing size. Each segment is anchored to the massive concrete floor slab, and segments are joined by more I-beam framing at the principal corners at the top of the vertical walls and along the top of the angled flat roof. The cross-sectional shape of the two bays, which share a common internal wall, is rectangular with deeply chamfered corners. Both bays are reinforced at the rear by additional angular I-beam bracing to withstand launch blast. Two large, circular, frame-deflection tubes exit the rear walls and apparently angled to the sides. Both have been partially dismantled, and remaining pieces lie nearby. Walls consist of corrugated steel with thick insulation held in place by expanded mesh covering interior surfaces, probably for noise suppression. Launch catapults have been removed, but parts remain outside the structure. 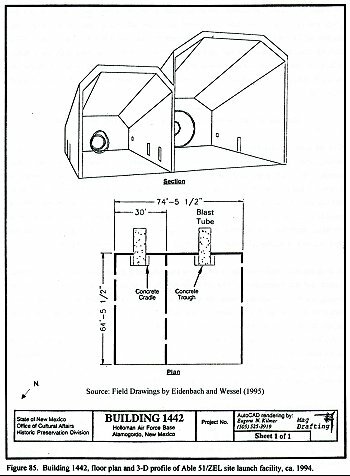 According to Wayne Mattson (personal communication 1994), the Hardsite Shelter (Plates 19 and 20) was originally designed to counter the threat posed by nuclear attack on conventional runway aircraft launch facilities. The building, made from plate steel supported within an exoskeleton of steel I-beam framing, was designed to withstand nuclear overpressures, protecting aircraft and missile systems and providing zero-length catapult launch at an upward angle of about 15 degrees. After test flights by manned F-84 fighter aircraft and a series of dummy launches (beginning 15 May 1959) by North American Aviation engineers, the first manned F-100 fighter aircraft, boosted by a 130,000-lb thrust Astrodyne solid-fuel rocket, was successfully launched on 19 August 1959. Additional manned flights continued until 26 August. The first Mace (a TM-76A) launched from the smaller bay of the hardsite (as in Plate 21) took place on 12 May 1959. A total of 6 TM-76B Mace flights were made before the program was transferred to Patrick AFB for subsequent test phases. My thanks to the Cultural Resources Manager, Wright Patterson AFB, for the correction. 9th Air Force, TAC, based at Orlando AFB, Florida, which maintained a detachment at Holloman AFB, New Mexico for TM-76A crew firings, and a detachment at the Cape (Camp Happiness) for TM-76B crew launches. Above: "One of the most important Air Force projects came to a dramatic climax at Holloman Air Force Base with the first flight of a Martin Mace Missile to be guided by an all inertial guidance system. This represents a significant step forward in America's guided missile program, and adds a new and potent weapon to America's arsenal for defense. AC is proud that the spark that releases all the power of the Mace's jet turbine comes from an AC Jet Igniter Spark Plug. Guidance system and spark plug alike come from the engineering and production genius of AC." The TM-76A Mace graphic, shown in R&D colors, was found in the Corel collection of Clip Art! Some of the guys here may remember conversations a while back, where Dockeen, Prop... and I were talking about missile launches from Santa Rosa Island, Florida in the late '60s. I stumbled across this shot while websurfing tonight, depicting an MQM-13A Mace (57-2446) launch from Site A-15 on the island. The picture, taken from a rickety wooden tower in the dunes, due east of the pad, shows our Mace (an ex-nuclear missile, now a faded target drone,) roaring off with the then functioning BOMARC launchers in the background. The neat thing about this is that I took the picture! That is a shock to see your past by accident. This was our unit Christmas card that year, and A2C Denny Keasling, then my roomate, must have sent the card to the webmaster. A TM-76B during pre-launch check at Cape Canaveral while mounted on a TM-76A translauncher during Research and Development testing. Research continues on the guidance system used and how the bird was launched. Notice the ARW-59 Command Guidance antennae mounted on bottom the vertical stabilizer, and the single air conditioning hose entering the warhead section but not the nose A/C as in operational missiles. 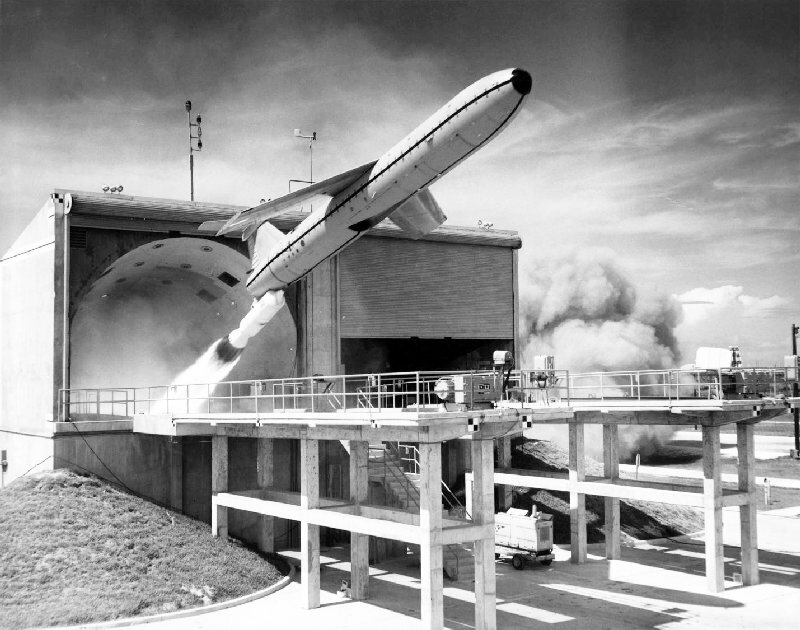 A color USAF photograph of a TM-76B launch at Cape Canaveral using one of the two hard sites built to test the hard site launch characteristics, and the same photo below, reversed in black and white. Notice the location on the weather vane and the lights on top of the launch tubes in both photos. A TM-76B Mace launch at Cape Canaveral, 9/21/60. The Final R&D (SOTE: Systems Operational Test and Evaluation) flight of the TM-76B took place on June 21st, 1961. (NASA History of Events). The final Mace test and evaluation flight covered 1100 miles. Air Force crew training launches conducted by the 4504th MTW, assisted by the 6555th Aerospace Test Wing, continued until 1964. The planned launch of a CGM-13B Mace missile from an operational site at Kadena, Okinawa, Project Sunset Lily in 1966, was cancelled.